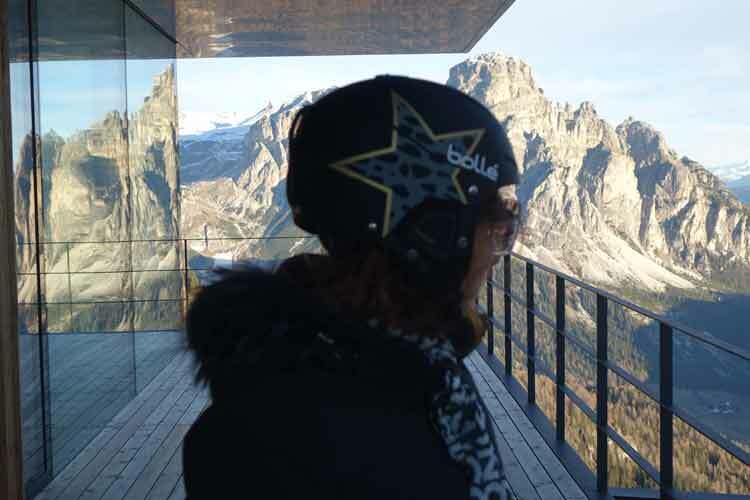 It is my first time visiting Alta Badia which is situated in the northern part of Italy. This inviting South Tyrolean valley in the Dolomites has to be one of the most spectacular skiing and eating adventures to date for me. My parents come from the South of Italy and I grew up in rural Australia on a farm. We lived off the land and ate what was in season and everything was of Italian cuisines. 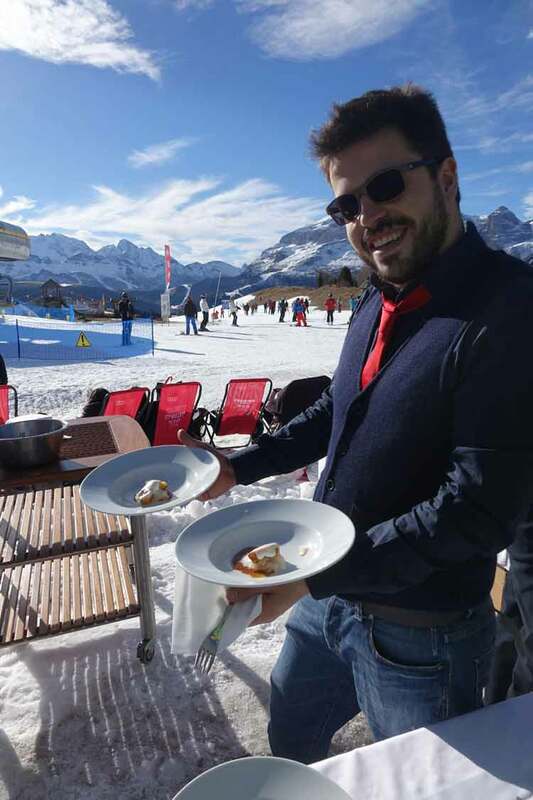 I was invited by Alta Badia tourism to experience its Gourmet skisafari, skiing, trending skiwear and eating mountain food for a whole day. 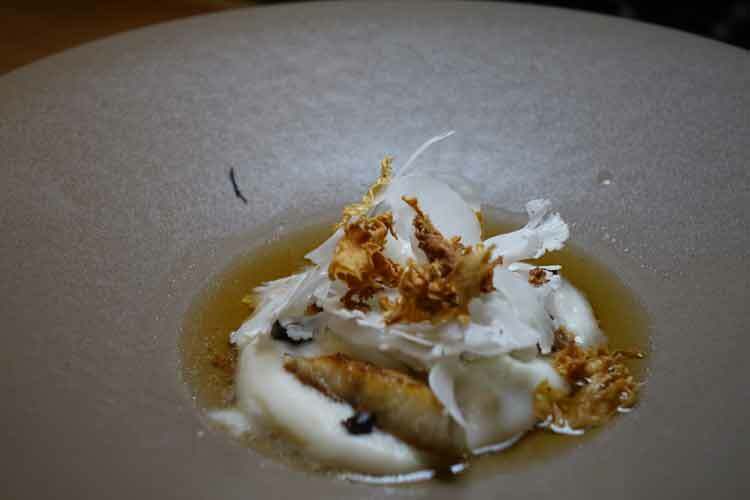 I have never heard of the Gourmet Skisafari, but with the dishes that were going to be presented here and with the 5 Michelin starred chefs preparing it, I was keen to explore. The night before the Skisafari I had a welcome dinner called “Table Hopping”. Here I had the chance to meet two of the local chefs that were part of the Gourmet Skisafari. 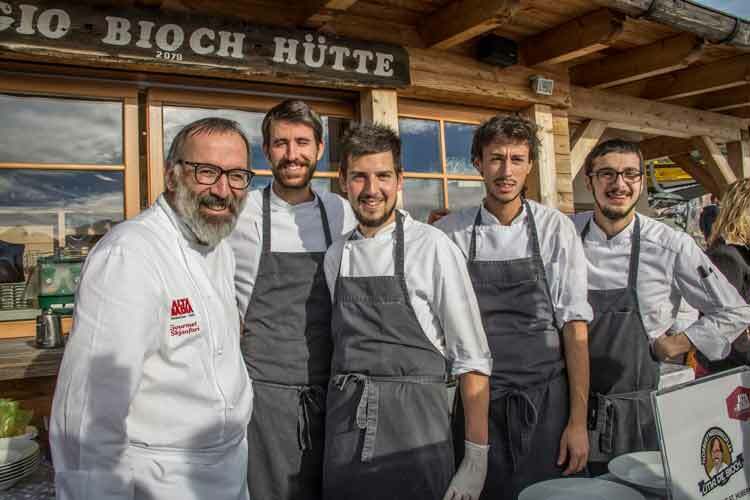 The two restaurants of the hotels were Ciasa Salares where Matteo Metullio is the chef and Relais and Chateaux Hotel Rosa Alpina with chef Norbert Niederkofler. I experienced first hand the best mountain food I’ve ever had, thanks to both chefs. 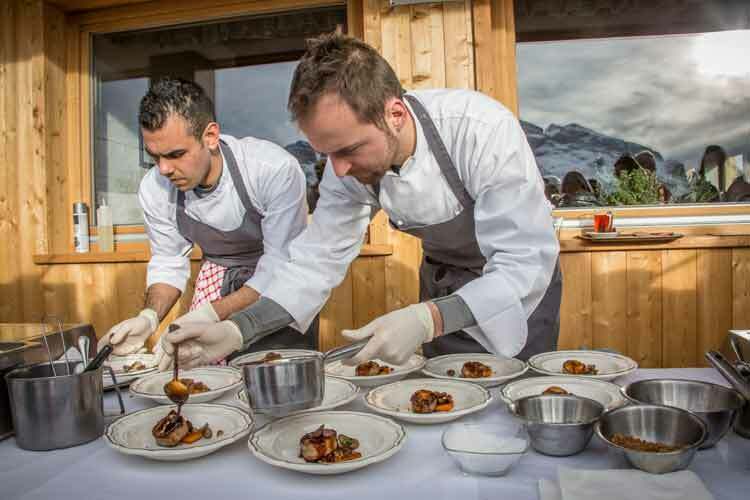 So for me the challenge was could these these two chefs combined with the other three chefs produce on the slopes in the mountain huts the next day. Below you see Matteo in action, he received his Michelin star at the age of 24, the youngest chef ever to receive one in Europe. 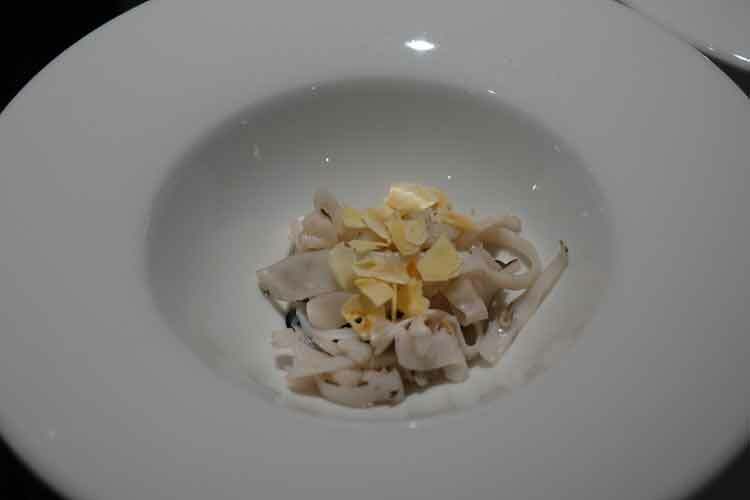 Next in action was Two Michelin Starred Norbert Niederkofler. I was specifically impressed with the chocolate table at the end. Throughout the evening matching wines were presented thanks to Cantina Tramin Kellerei. 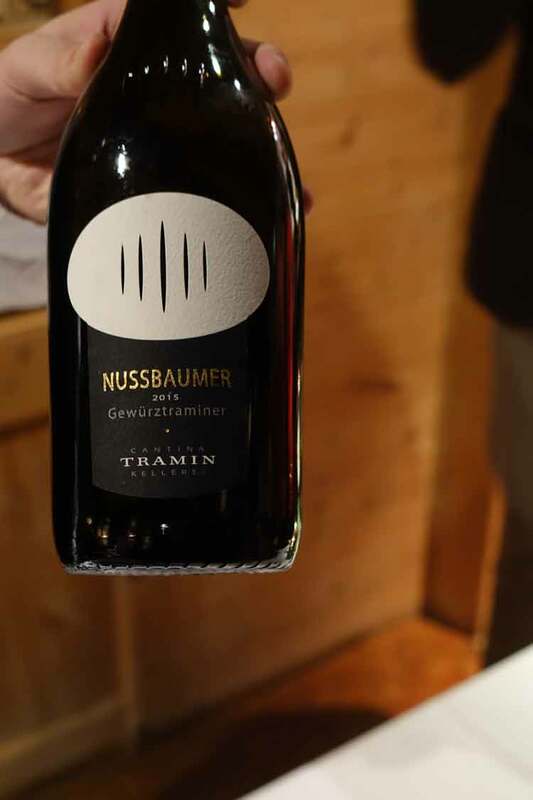 They specialise in Gewürztraminer wines, this tiny bottle was the dessert wine. I loved it. Alta Badia is a ski resort in the Dolomites of northern Italy, in the upper part of the Val Badia (German: Hochabtei) in South Tyrol. In talking to the locals, they explained that this was a very rich part of Italy. 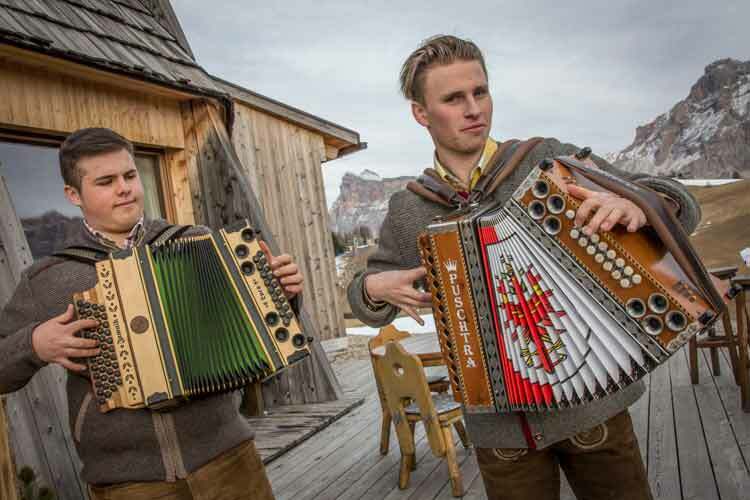 In Alta Badia which is part of South Tyrol German is most commonly spoken. 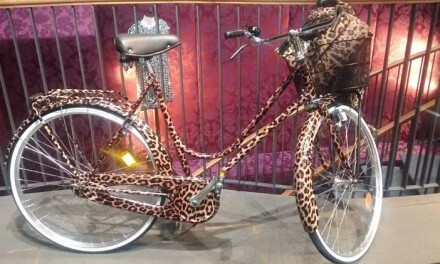 I could see there was a mix of Italian culture blending into a German inspired way of being. 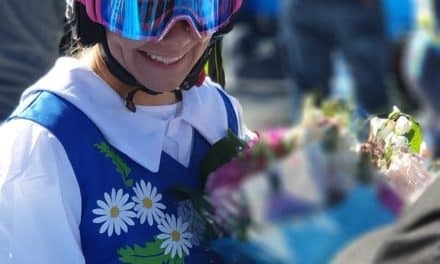 I have skied throughout Europe over the years and when it comes to eating on a ski resorts, the food can be a hit an miss and most of it can be very expensive. The Table Hopping event left me excited for what was to come. 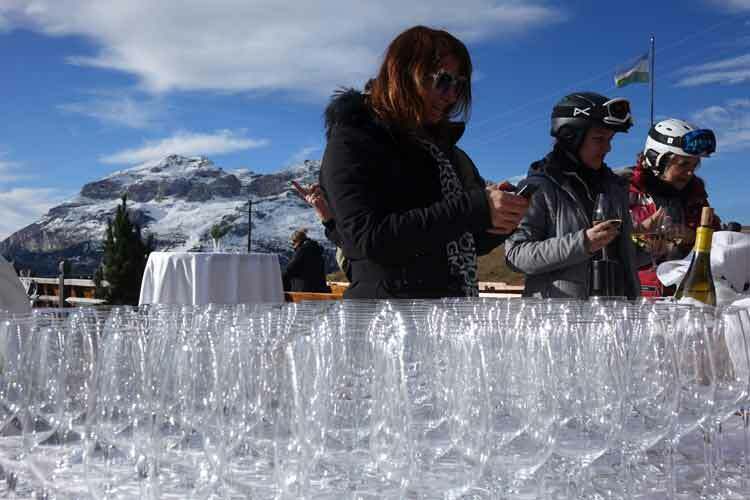 The next morning I ventured up to the Piz Boe Alpine Lounge where we were served breakfast. I could not believe the breathtaking views that greeted me. I ski often so I am familiar with mountain living and spectacular views. I have never skied in where grass could be seen throughout the valley intertwined with artificial snow on the ski slopes, it was truly a beautiful combination. 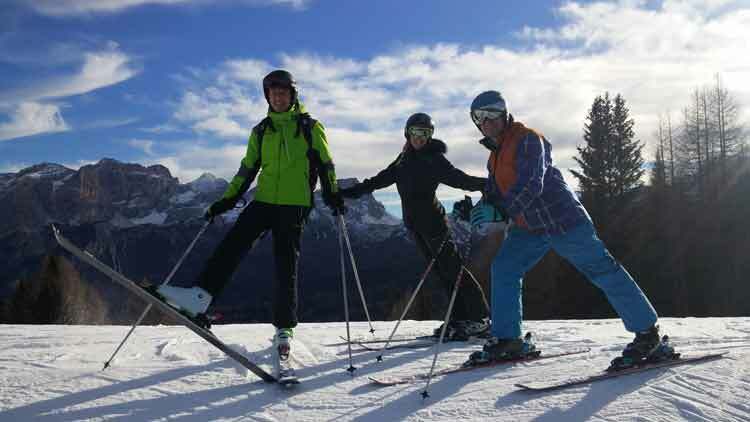 Alta Badia is state of the art when it comes to ski technology. You never have to worry about the lack of snow. They have the tools to make sure you are skiing on high quality snow. Combined with this, I was so impressed with the telecabins and chairlift facilities, they have to be one of the best I have ever seen and experienced. 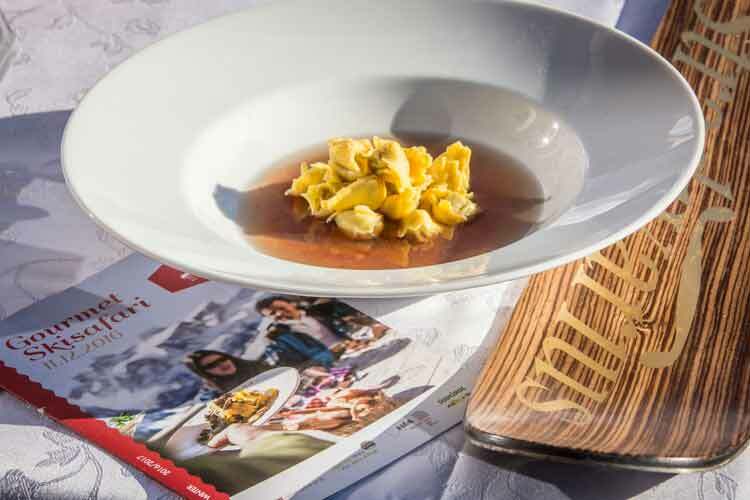 This was the 5th Edition of the Gourmet Skisafari, in where I skied from one mountain hut to the next, tasting five different dishes created by 5 different Michelin starred gourmet chefs. This event which was held only for 1 day started at 11 am and finished at 3 pm. The price tag was €50 and tickets with tickets for sale at the participating mountain huts. 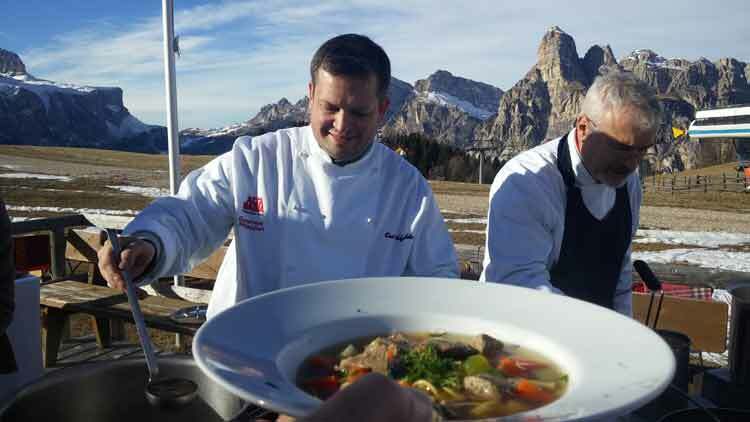 The exciting part of this adventure was meeting the chefs, who came from the most renowned ski destinations in the world. On my next stop I crashed and burned at Utia I Tabla with chef Esat Akyildiz from The Ritz Carlton Almaty. 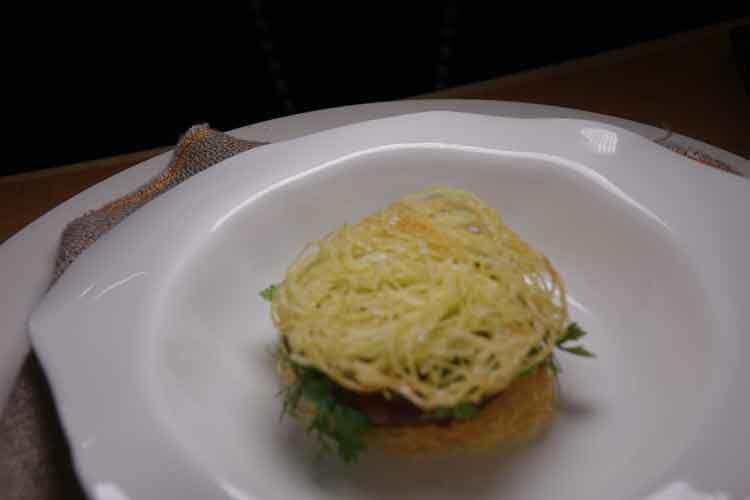 I ate Kespe Sorpa which was fresh noodles with aromatic bouillon. 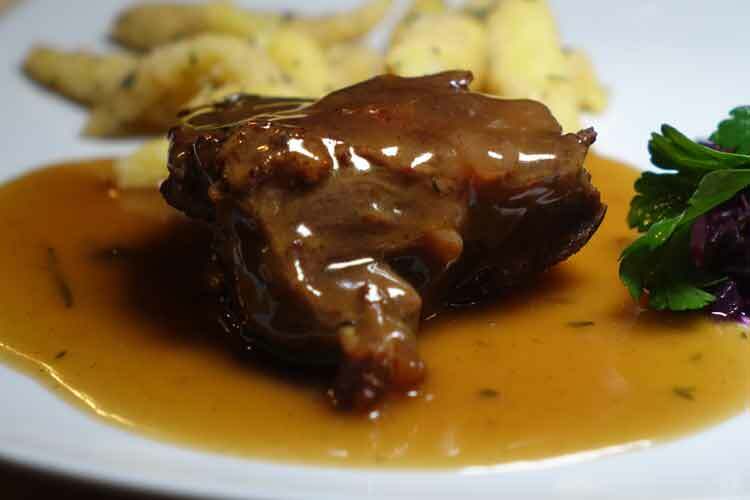 This was teamed with a wine called Alto Adige Pinot Bianco, Sudtirol Weissburgunder. 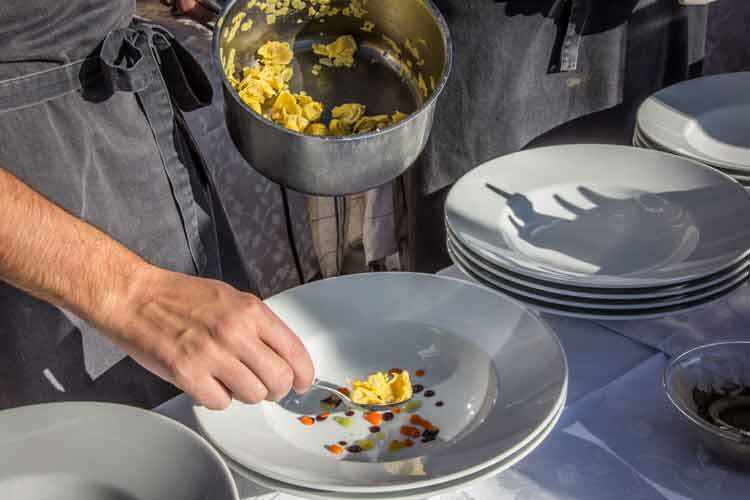 Combining outdoor fun without knocking down trees, I headed to Club Moritzino with young Chef Matteo Metullio from La Siriola. 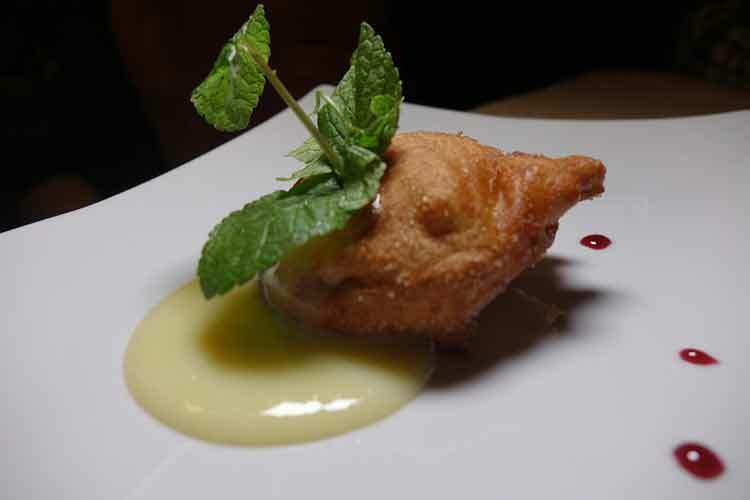 I ate sweetbread of fried veal on scampi mixture, smoked Jerusalem artichoke froth and liquorice and aniseed salsa. I drunk the Alto Adige Sauvignon or also know as Sudtirol Sauvignon. 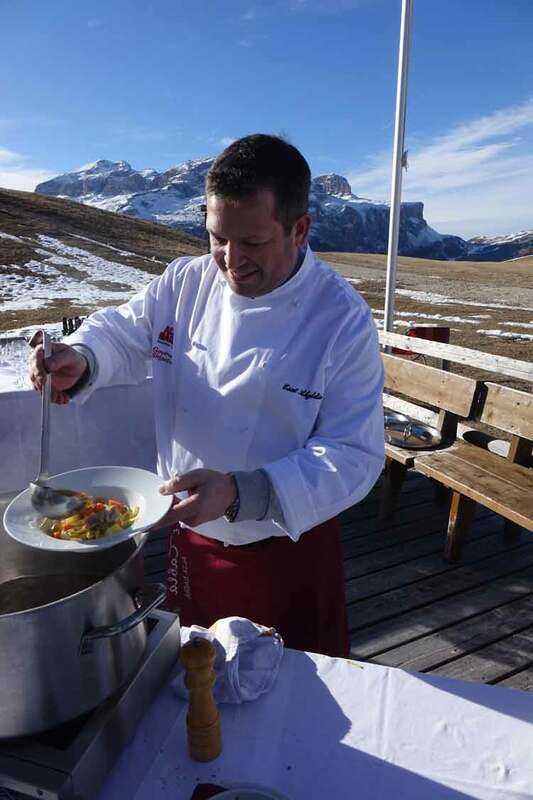 For my forth stop I skied to, Piz Arlara to be greeted by Chef Thosten Probost from Griggeler Stuba. 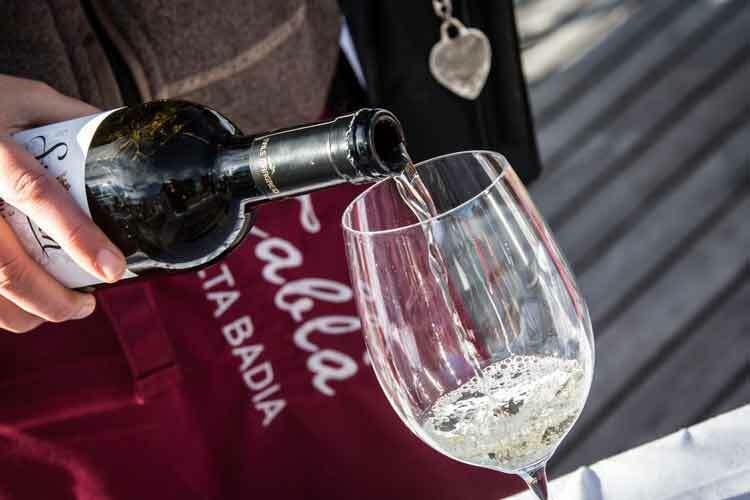 I had Tartare dell Alta Badia and teamed it with Alto Adige Pinot Nero, Sudtirol Blauburgunder. There was a great atmosphere here. For my 5th experience I was going to have the roast Bleggio rabbit but this one got away. This was at Utia Col Alt mountainhut where I arrived at 2:43pm to be greeted by no one. As the Chef Nicola Laera/la Stua de Michil had already packed up and gone. To compensate I was given some extra wine. 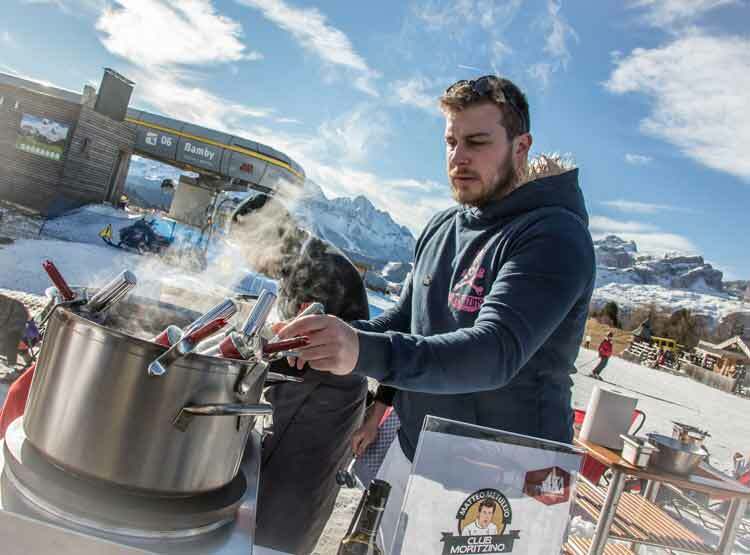 This was an unforgettable ski experience with gourmet food combined with some of the best ski location. 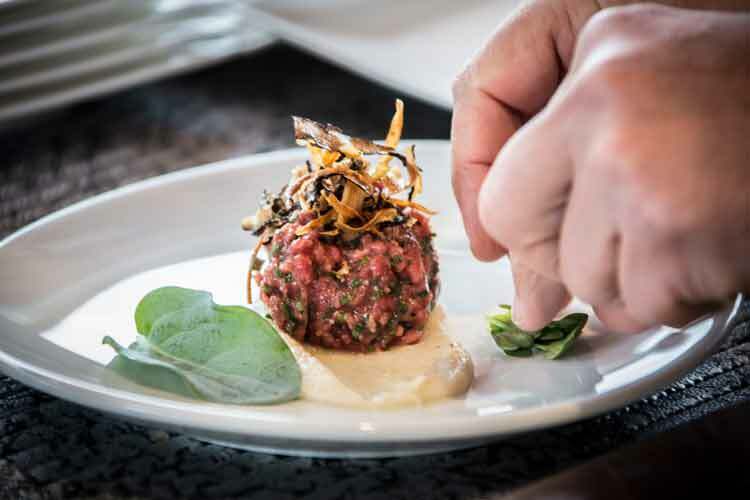 The 5 chefs pulled out all the stops to deliver high quality tasty food. 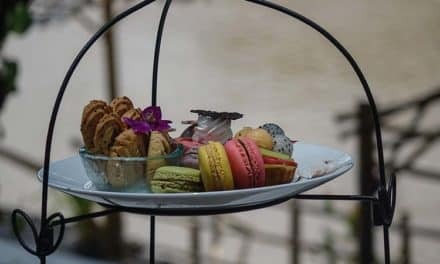 The service, the presentation along side with the tasting of gourmet food literally from a mountain top was what I define the world of luxury. I could observe from my team mates and other guests that I was not alone on this rare adventure. There comes a time in life where less is more. 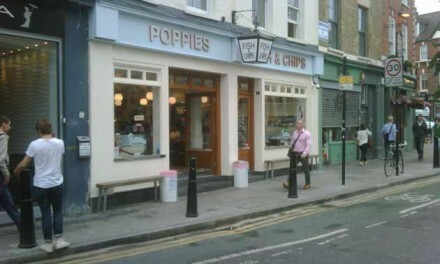 On this occasion, I was left gagging for more. With all the food and wine it was time to head back to the hotel. I needed to rest as another dinner was organised for me later that evening. After resting and pampering my aching body at the adult only Sauna at Chateaux Hotle Rosa Alpina, I was driven to L’Tama mountain hut. This hut is well known for its meat dishes from its farm. The drive to the hut even though it was dark, was steep and mystic, as was the Ladin dinner that was waiting for me. The Ladin people are an ethnic group that live in the valleys of Badia, Gherdëina, Fassa (Trentino), Livinallongo and Ampezzo. 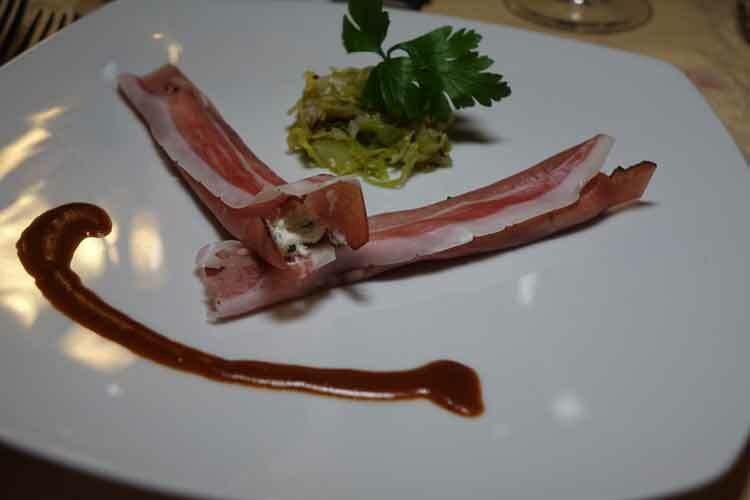 My entree was Involtini di Speck with ricotta of the mountains. The cabbage was yummy and the combination was unique. 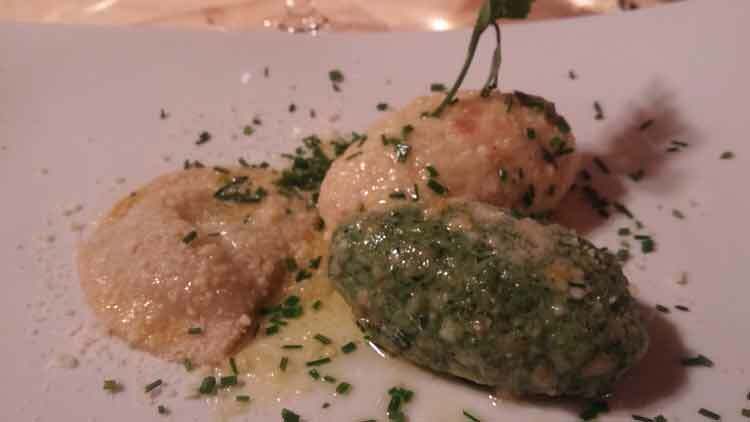 My first plate was called Tris Ladin a spinach gnocchi with cheese and a ravioli with spinach and ricotta cheese. This was truly delicious and as far as this restaurant goes I would highly recommend asking for a gnocchi dish when coming here, they do it well. My main course was Guanciale of Veal with gnocchetti combined with vegetables. The veal was tender and the gnocchi once again just melted in my mouth. 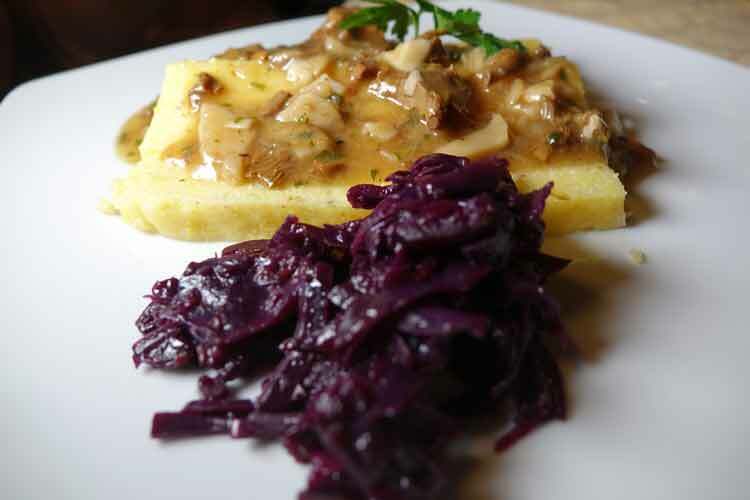 There was also a vegetarian option, Polenta with Funghi. Dessert was fried apple tart. Apples here in the South Tyrol area are fantastic to eat, so make sure you feast on apples during your stay. Day 2 with an amazing amount of great food was over. Time to head back to the hotel and rest as the next day was skiing with no agenda. 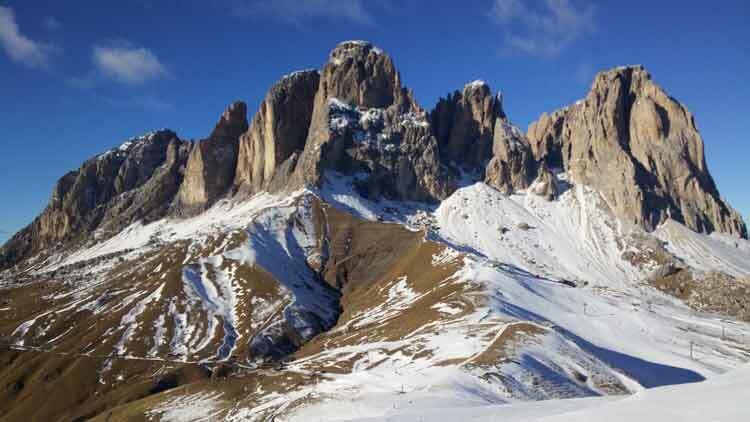 The Sellaronda is a ski tour through the ski resorts Val Gardena, Alta Badia, Arabba and Val di Fassa. With my Dolomiti Superski pass I could attempt to do the whole circuit around the Sellamassif on skis. The area is using one of the best skilifts and for me this was the best ski tour adventure in Europe I have ever done. God blessed me with one of the finest of days with clear weather and abundant sunshine. It was one hell of a Instagram photo shoot experience that a social media expert like myself could only ask for. The slopes were long, endless and amazing. Throughout the day, I had to keep reminding myself that I was on earth. The food up here was excellent too. 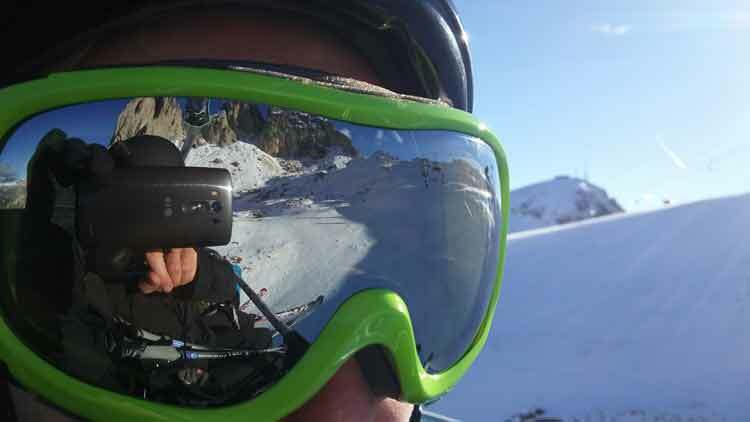 The fashion on the slopes was as eccentric, fierce and inviting as my eye-wear. Hey we are in Italy after all and therefore I encourage you when visiting here, you better bring out your finest of clothing on the slopes.